The spin-off title will play more like a competitive tower defense game than a classic RTS. Tom Clancy's EndWar might not have been the watershed moment in gaming that Ubisoft expected. 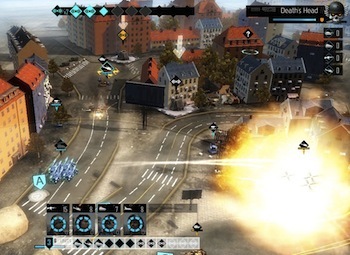 The 2008 title sought to bring the real-time strategy genre to consoles using voice commands, with mixed results. Now, half a decade later, Ubisoft is brushing off the franchise with EndWar Online, a F2P browser-based spin-off that's less like an RTS, and more like a competitive tower defense game with resource management. "The original game was on console and it was faction versus faction, but what was lacking was not everyone was connected," EndWar Online's creative director Michal Madej told Polygon. " There wasn't a shared theater of war. But on browser, almost everyone has a web browser, so we can try to achieve the goal of the original EndWar of having everyone be connected." While there will be a single-player campaign, the focus will be on competitive PvP. Each mission takes place in a tower defense-like arena, where players send out various unit types against each other while attempting to defend their base. It will follow the original's rock-paper-scissor setup, where helicopters beat tanks, anti-air beats helicopters, and tanks destroy pretty much everything else. Each unit will have an upgrade tree, but the depth and persistence of those upgrades has yet to be announced. Expect EndWar Online to go into closed beta later this year, but you can go ahead and sign up on the official site today.